Vetalintex Hydrogel is a clear, starch-based dressing using revolutionary hydrogel technology for improved wound management. 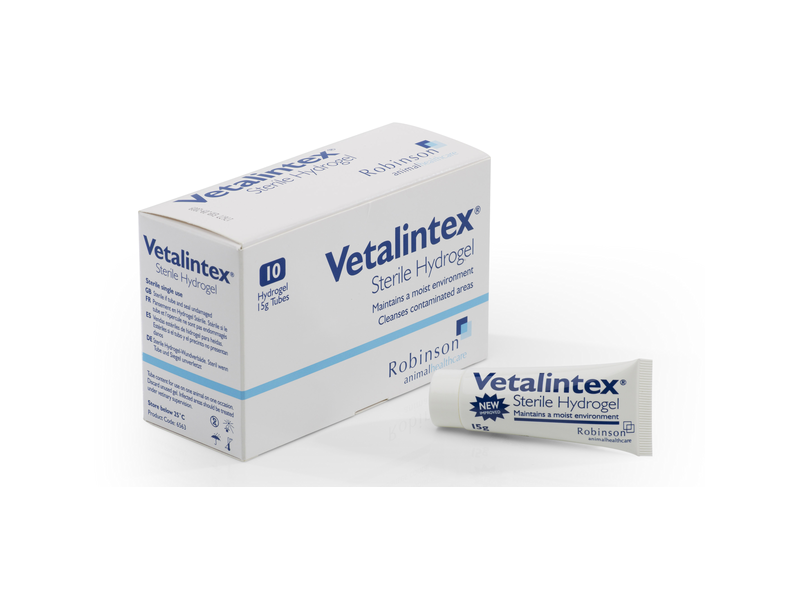 Vetalintex Hydrogel is quickly and easily absorbed, gets rapidly to work and is indicated for the cleansing and debridement of sloughy, dry or necrotic wounds. Creating the ideal conditions for rapid recovery, Vetalintex Hydrogel is ideal for wounds that require that extra support. Benefits: Minimum disruption to healthy cells Maintains desirable moist interface which facilitates cell migration Allows single-handed application Avoids unneccessary and expensive dressing changes. Administration: Vetalintex Sterile Wound Hydrogel should be applied directly to the wound surface before applying an approriate secondary dressing. Apply generously to a depth of about 5mm. Dressings should be changed frequently dependent on the condition of the wound and the amount of exudate. Below are some recent questions we've received regarding Vetalintex Hydrogel Wound Dressing, including answers from our team. You could use this dressing safely as long as you replace it every day. However it is difficult to keep a dressing on a cat unless you are very determined. I suspect your cat is feeling itchy so you should ensure that you flea control is absolutely perfect. You could perhaps try an "elimination diet" trial to see if a dietary allergy is playing a part in things. If in doubt, speak to your vet.